Whole Body Yeast Balance™ / 10 days - Nature's Way®. Days 1-5 only: Take 2 softgels at night. Days 1-5: Take 4 capsules at night with at leaset 8 ounces of liquid. Days 6-10: Take 4 capsules in the morning with at least 8 ounces of liquid. If taking any medications, consult a healthcare professional before using Probiotic Pearls. 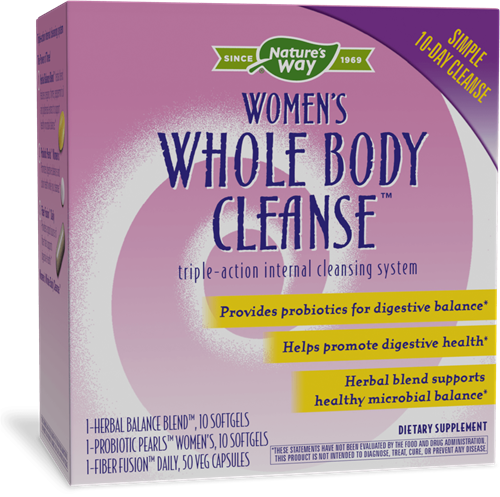 Can I use Whole Body Yeast Balance at the same time as Whole Body Cleanse™† internal cleansing system†? Are there any dietary restrictions that should be followed while using Whole Body Yeast Balance? It is particularly important to minimize sugar intake when using Whole Body Yeast Balance. As a general recommendation during any cleanse, we also suggest avoiding foods known to be problematic for some people, including wheat, peanuts, soy, shellfish, and dairy products, and concentrating on increasing intake of fresh fruits and vegetables, whole grains, and lean protein. We also recommend eliminating caffeine during a cleanse simply because this is a time to focus on improved health. It is also important to drink at least 64 ounces of bottled or filtered water every day while cleansing. However, with the possible exception of minimizing sugar intake, there are no foods that are absolutely contraindicated while using Whole Body Yeast Balance. Contains fish (Tilapia) and soy. Do not take Fiber Fusion Daily if you have difficulty swallowing. Take this product with at least a full glass of liquid. Taking without adequate liquid may cause choking. If you experience chest pain, vomiting, or difficulty swallowing or breathing after taking Fiber Fusion Daily, seek immediate medical attention. If pregnant, nursing, or taking any medications, consult a healthcare professional before using Fiber Fusion Daily. Do not use if pregnant or nursing. If you have diabetes or are taking any medications, consult a healthcare professional before using Yeast Balance herbal blend.